To take the advantage of pleasures of the Mediterranean Sea, discover flavors and landscapes of the French Riviera either stroll under the sun of Provence, the Hotel Restaurant Poséidon will welcome you in a peaceful frame, feet in the water ! 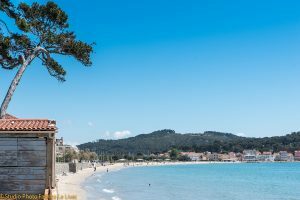 Situated in the village of Les Sablettes, in front of ” Les Deux Frères “, with a direct access on the natural beach of fine sand. Come to stay in our establishment and take advantage of our location in the heart of this atypical sea resort. The establishment has two different buildings, the one Concerning Le Parc, standard rooms, and the other side Le Patio, superior rooms, answering the standards of Hotels **. The Hotel Restaurant is accessible to person with reduced mobility. 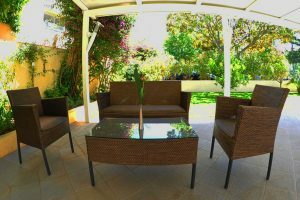 These two different atmospheres will allow you to pass a pleasant moment in front of the sea, to get fresh ideas on our shaded terrace in front of the house dating of the XIXth century, or to relax you after a long day of idleness. In family, for a business trip or for your seminaries, we shall propose you the package adapted to your needs. All the rooms have a key giving a direct access to the beach of Les Sablettes. For the amateurs of Provençal games, let’s have a play on our petanque area. The establishment has a free and private parking. A laundry service can take care of your clothes. 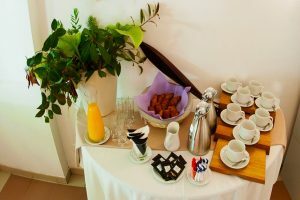 A continental breakfast buffet is proposed in our restaurant from 7:30 am till 10:00 am. For your lunches, business meeting or seminaries, our restaurant develops every day his menus refined to awaken your papillae. In summer, you can even taste our dishes and our tapas on our shaded terrace. All our team is pleased to welcome you so that your stay is a real success. For any late arrival, please contact the hotel.